My research trip to Utah from May 8 through May 11, 2014, proved successful. I met many wonderful people who provided me excellent advice on the questions I posed relating to my writing of Golden Spike, The Iron Horse Chronicles–Book Three. I visited numerous exciting sites where Will Braddock and his friends will engage in their continuing adventures in the third and final book in the trilogy. After driving almost five hundred miles from Henderson, Nevada, on May 8, I added a detour through Utah’s Echo Canyon and on into Wyoming before proceeding to my hotel in Ogden. Echo Canyon and Echo City will figure prominently in the opening chapters of Golden Spike. I find it helpful to walk the ground on which Will Braddock acts out his quest. I had been through the canyon a couple of times previously; but after outlining book three, I realized there were some sites that required further exploration. I spent May 9 at Ogden’s Union Station. They were preparing to celebrate the fiftieth anniversary of the depot the next day. This depot was built long after the time of Will Braddock’s visit to Ogden, but the depot’s museum contains plenty of artifacts and photographs to help me visualize the time of the building of the first transcontinental railroad. Ogden will feature in the middle portion of Golden Spike. I will provide you more information about Union Station in a future blog. On May 10 I witnessed the reenactment of the joining of the Union Pacific and Central Pacific railroads at Promontory Summit, Utah. 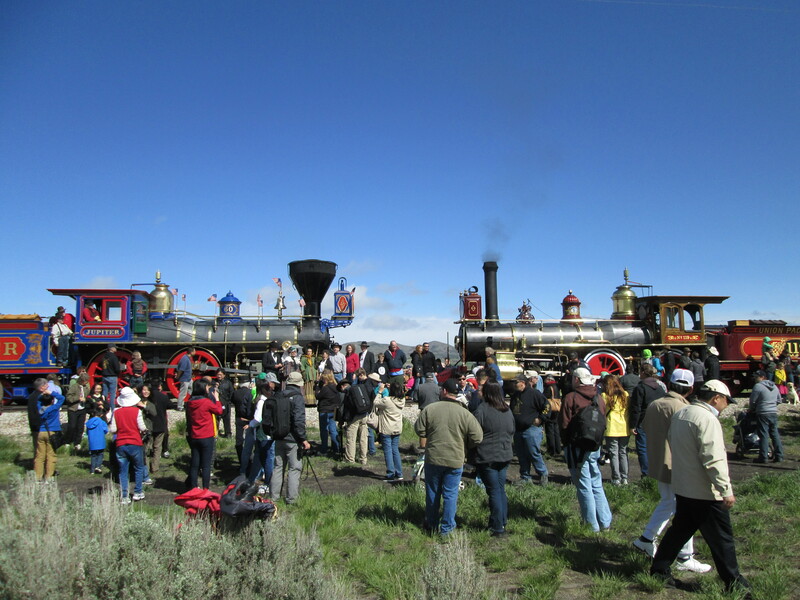 The Golden Spike National Historic Site hosted a large crowd to participate in the 145th anniversary of the driving of the golden spike. Although it was a cold day, all those in attendance, including myself, enjoyed a well-organized, authentic presentation. Will Braddock and his friends will participate in the completion of the Pacific Railroad in the closing chapters of Golden Spike. I plan to tell you more about my visit to Promontory in a future post. The drive back to Nevada on May 11 was a thrill in itself. I drove through a snowstorm for over two hundred miles. Most of the time I got behind a snowplow, until it pulled off the highway; then I climbed in behind a big truck, staying far enough back so the truck driver could see me in his mirrors. By following the paths opened by the big rigs, I was able to keep pressing ahead. I was just glad I wasn’t following these guys! This entry was posted in Central Pacific, Geography, Golden Spike - Book Three, Iron Horse Chronicles' Characters, Museums and Parks, The Iron Horse Chronicles, Transcontinental Railroad, Union Pacific and tagged Adventure Fiction, Fictional Character, First Transcontinental Railroad, Frontier Fiction, Historical Fiction, Historical Parks, Locomotives, Museums, Teen Fiction, Trains, Westward Expansion (1867-1869), Young Adult Fiction, Young Readers. Bookmark the permalink. I enjoyed your recount of the trip to Utah. Waiting with anticipation for your books to be out to read. Good luck with # 3! And Wow, what a snow storm! What a fun adventure. I would have enjoyed seeing the reenactment.